Designed by 3 Cincuentayuno Luxury Pools, the Arboledas pool at the Club de Golf La Hacienda in Atizapan de Zaragoza, México, welcomed club members to the new facility in March 2019. The exclusive aquatic architects specified Penetron crystalline technology to ensure a durable and waterproof pool structure and deck. To provide the necessary strength and durability, the concrete for these exclusive pool structures is treated with PENTRON ADMIX. Added to the concrete mix during the batching phase, the crystalline admixture ensures a completely waterproof concrete matrix. 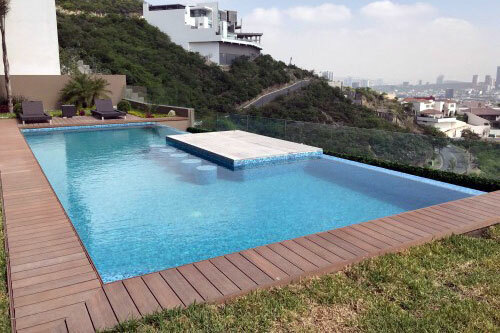 This summer, Penetron México helped 3 Cincuentayuno complete the Arboledas project, a large, L-shaped pool design (12 x 6/2 m) at the Club de Golf La Hacienda in Atizapan de Zaragoza, located in the México City metropolitan area. After careful review of the technical parameters of the Arboledas project, the 3 Cincuentayuno project engineers specified Penetron crystalline technology, including PENETRON ADMIX, PENEBAR SW swellable waterstop, and topical applications of PENECRETE MORTAR, PENEPLUG and PENETRON. Once PENETRON ADMIX is added to the mix, it reacts with the water in the concrete. The resulting impermeable crystalline network becomes an integral part of the concrete matrix. As described in “Report on Chemical Admixtures for Concrete” published by the American Concrete Institute (ACI), “permeability-reducing admixtures for hydrostatic conditions (PRAHs),” i.e. crystalline admixtures like PENETRON ADMIX resist water penetration against hydrostatic pressure and have proven to be the most effective PRAH products with clear advantages over hydrophobic materials based on other mechanisms or ingredients. For more information on Penetron waterproofing solutions, please visit penetron.com or Facebook.com/ThePenetronGroup, email CRDept(at)penetron(dot)com or contact the Corporate Relations Department at 631-941-9700.